The Sunday before Easter at which Jesus’ triumphal entry into Jerusalem (Mt21: l-11, Mk 11: 1– 1 la, Lk 19: 29– 0) and Jesus’ Passion on the cross (Mt 26: 36– 27: 66, Mk 14: 32– 15: 47, Lk 22: 39– 23: 56) are recalled. It is also known as the Sunday of the Passion. Palm Sunday is the first day of Holy Week. Red is the liturgical color for the day. 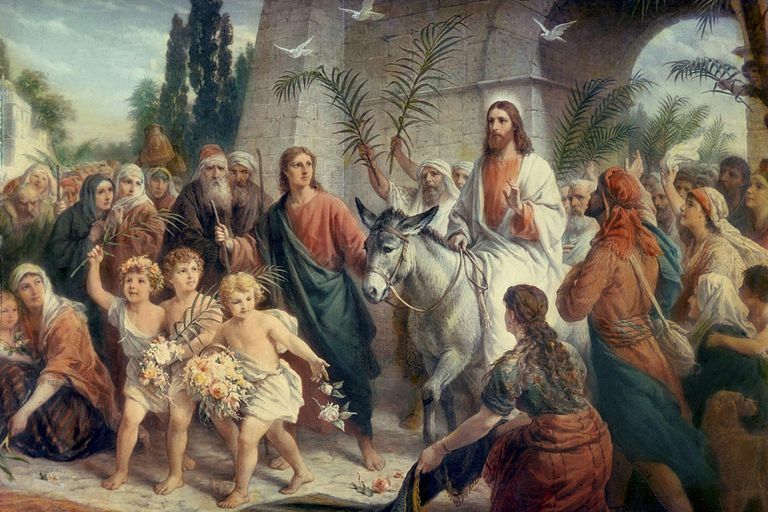 The observance of Palm Sunday in Jerusalem was witnessed by the pilgrim Egeria in about 381– 384. During this observance there was a procession of people down the Mount of Olives into Jerusalem. The people waved branches of palms or olive trees as they walked. They sang psalms, including Ps 118, and shouted the antiphon, “Blessed is he who comes in the name of the Lord!” The Palm Sunday observance was generally accepted throughout the church by the twelfth century. However, the day was identified in the 1549 BCP as simply “The Sunday next before Easter.” The blessing of branches and the procession were not included. The 1928 BCP added the phrase “commonly called Palm Sunday” to the title of the day. A form for blessing palms was provided by the Book of Offices (1960). The 1979 BCP presents the full title for the day, “The Sunday of the Passion: Palm Sunday” (BCP, p. 270). The liturgy of the palms is the entrance rite for the service. The congregation may gather at a place apart from the church and process to the church after the blessing of the branches of palm or other trees (BCP, p. 270). The liturgy of the palms includes a reading of one of the gospel accounts of Jesus’ entrance into Jerusalem. The branches may be distributed to the people before the service or after the prayer of blessing. All the people hold branches in their hands during the procession. Appropriate hymns, psalms, or anthems are sung. The Prayer Book notes that the hymn “All glory, laud, and honor” (Hymns 154– 155) and Ps 118: 19– 29 may be used (BCP, p. 271). The Hymnal 1982 also provides “Ride on! ride on in majesty!” (Hymn 156) and “Hosanna in the highest” (Hymn 157) for the procession at the liturgy of the palms. The Hymnal 1982 provides musical settings for the opening anthem, the blessing over the branches, and the bidding for the procession (Hymn 153). The procession may halt for a station at an appropriate place such as the church door. The BCP provides a stational collect which may be used (p. 272). The palm liturgy may be led by a deacon or lay reader if a bishop or priest is unavailable. When the service includes the eucharist, the liturgy of the palms is followed by the salutation and the collect of the day. The service changes focus abruptly from the triumphal entry into Jerusalem to the solemnity of the Passion. In the 1979 BCP, the Passion gospel is drawn from one of the three synoptic accounts of the Passion, one of which is appointed for each of the three years in the eucharistic lectionary. The Passion gospel is announced simply, “The Passion of our Lord Jesus Christ according to __________.” The customary responses before and after the gospel are omitted (BCP, p. 272). The Passion gospel may be read or chanted by lay persons. Specific roles may be assigned to different persons, with the congregation taking the part of the crowd (BCP, p. 273). It is customary to observe a brief time of silence when the moment of Jesus’ death is described by the narrator. The Hymnal 1982 provides a variety of hymns concerning the Passion, including “Sing, my tongue, the glorious battle” (Hymns 165– 166), “O sacred head, sore wounded” (Hymns 168– 169), and “Were you there when they crucified my Lord?” (Hymn 172).